Being a Brisbane air conditioning electrician means that we’re in demand at this time of year! As the heat ramps up in Brisbane, people are looking for the most effective and efficient ways to keep their homes and offices cool this summer. 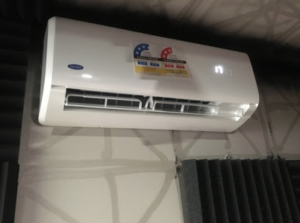 This is a commercial air conditioning installation we did at a local sound mixing studio to help keep the office and the team cool. As a commercial electrician and a domestic electrician, we can provide air conditioning systems to suit all sizes of premises. There are so many different models available and we’re happy to provide advice on the best air conditioning system to suit your needs at your home or business. Contact us today to help stay cool this summer with an air conditioning installation in Brisbane. Electrical Cable Repair: Dog Vs Wiring!